The boy genius twice over. 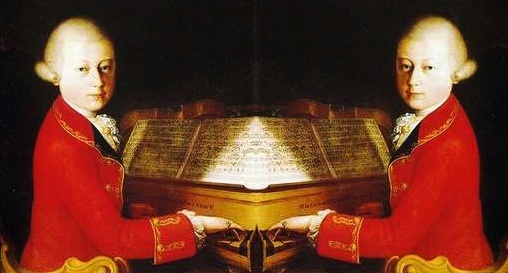 My earlier post about the amusing contretemps I witnessed at last weekend's Boston Baroque concert has been getting a lot of play on sites like Universal Hub, but it would really be too bad if that concert was only remembered for that particular incident, because honestly, it featured one of the most astounding keyboard performances I've ever had the pleasure to hear in my life (and I've heard just about everybody, going all the way back to Rubinstein). Actually, to be specific - it featured the most transporting double performance on fortepiano I've ever heard in my life. The players were Robert Levin and his wife, Ya-Fei Chuang; the piece was Mozart's Concerto in E Flat Major for two pianos and orchestra (K. 365). Both Levin and Chuang are local mainstays, of course (he's a professor at Harvard, she's at NEC), but we hear from Levin more often than Chuang, it seems. Here, however, Chuang took the lead - and to my mind she got the better fortepiano, too (plus the better gown - a sparkling number in pale periwinkle that looked absolutely stunning). I wasn't that familiar with this particular concerto, so for me the whole thing was a ravishment - it's one long swoon of rippling, silvery delight, boasting a haunting andante at its core (in which joy and melancholy seem to keep each other at bay in an almost heart-breaking way) that is simply to die for. And Levin and Chuang weren't just virtuosic individually - as the piece progressed they seemed to be merging into a single musical mind; again, I've never experienced a sense of musical ensemble as pure as this one (and I may never again). People actually began giggling in happiness at certain phrases, they were so elegant they almost tickled you; this was like listening to Ariel's music on Prospero's island; the performance was absolutely perfect. Oh, yeah, the orchestra; they were good too (!). Sorry, I don't mean to sound flip; though inevitably slightly overshadowed by the pianists, the strings and the woodwinds were in particularly fine form, and Pearlman shaped the playing so that it always operated as an exquisite response to the fortepiano line(s). The conductor likewise made a subtle statement out of the opening Symphony No. 29 (K. 201), the last of Mozart's "early" symphones - indeed, I thought Pearlman made a better case for No. 29 than he managed with the later "Linz" Symphony (No. 36, K. 425), which I always find round and maturely rousing, but not much more. (Perhaps tellingly, Mozart wrote and copied out the parts in less than six days, when his hosts at Linz begged him for a new symphony.) The program was filled out by three of Mozart's arrangements of fugues from Bach's Well-Tempered Clavier, which, though of some interest, didn't really have the heft or depth of true concert music (Pearlman all but admitted as much in his comments from the stage). Still, after the Levins, I think everyone felt we'd already experienced more than a concert's worth of great music; Pearlman could have followed up with Twinkle, Twinkle Little Star and I wouldn't have minded.